Orange County Mayor Teresa Jacobs testified before the U.S. House of Representatives Committee Oversight and Government Reform on March 22 as a key witness on the heroin epidemic sweeping the nation and Central Florida. Florida Congressman John L. Mica conducted the National Oversight Committee Hearing. To focus on the growing heroin problem, last July Jacobs formed the Orange County Heroin Task Force and invited Orange County Sheriff Jerry L. Demings to serve as co-chair. The Task Force concluded its efforts last week, delivering 37 targeted recommendations, from increased bond and trafficking penalties to social media campaigns warning young people about the deadly nature of heroin, as well as additional education, training and treatment to fight the addiction. The Task Force also recommended expanding access to Naloxone, a life-saving drug used in severe overdose situations, and combining detox at the jail with “Medically Assisted Treatment,” using the drug Vivitrol to fight heroin addiction. Mayor Jacobs and Sheriff Demings convened Orange County’s Heroin Task Force to address the extraordinary spike in local heroin use and overdoses from the highly addictive drug. To tackle this problem locally, Mayor Jacobs asked Sheriff Demings to co-chair the interdisciplinary and multi-jurisdictional Task Force. The Task Force was comprised of key community leaders who provided their expertise in the areas of law enforcement, education and prevention, healthcare and treatment to address the increase in heroin use and overdose-related deaths in Orange County. At the final meeting of the Task Force on Monday, March 14, reports from four subcommittees were presented, including Chief John Mina, Orlando Police Department, Law Enforcement Subcommittee Report; Dr. Barbara Jenkins Superintendent, Orange County Public Schools, Education and Prevention subcommittee report; Dr. Kevin Sherin, Director, Florida Department of Health, Orange County, Healthcare Subcommittee report; and Director Phil Scarpelli, DCF Substance Abuse & Mental Health Services, Treatment Subcommittee. Although prescription drug abuse is still a serious problem, heroin has become easier to obtain and has a very high-purity level. Troubling studies have found that more young adult professionals are using the drug. For more information about the Orange County Heroin Task Force, please visit www.ocfl.net/heroin. 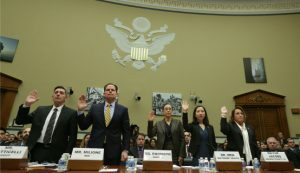 To view more photos from the hearing, visit Flickr.